All these steps took their toll on the quality of the images: Much like making a photocopy of a photocopy, the images of the moon created 40 years ago were fairly fuzzy and lacking in detail. But some NASA scientists had the foresight to make magnetic tape recordings of the radio-wave transmissions mid-way through the process. Now, after recovering the decades-old recordings and refurbishing outdated tape drives, a team of volunteers has begun digitizing the most famous images from the 1960s Lunar Orbiter missions with much-improved clarity and detail. On Monday evening a lavish reception was held at the National Air and Space Museum in Washington, DC on the occasion of the 40th anniversary of the Apollo 11 mission. The emcee for the event was Neil deGrasse Tyson. At one point, Tyson talked about the recent LRO images taken of the Apollo landing sites – and the hardware left behind. Our Apollo 11 landing site image was used to set the context for the LRO picture. 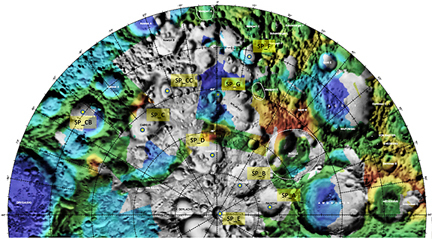 Mention was also made of the LOIRP – Lunar Orbiter Image Recovery Project. Here is a video shot with a small camera of Tyson’s comments regarding our image. 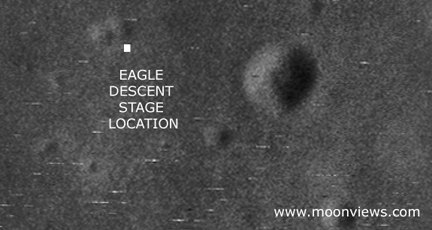 Image: Our retrieved image with the location of Apollo 11’s Eagle Descent Stage. With the 40th anniversary of Apollo 11’s landing on the Moon upon us, everything old is new – or so it would seem. Yesterday we saw digitally re-mastered footage released showing the first steps on the Moon in unprecedented clarity. Also this was made from a copy that itself was a copy. The original video, recorded live as the Moon walks were underway has slipped into history – either misfiled or, more likely, erased and reused years later – much like a floppy disk. That said, the new footage does provide a window into the past with detail heretofore unseen. Another place where windows are being opened into the past is the Lunar Orbiter Image Recovery Project (LOIRP) housed at NASA Ames Research Center. Utilizing ancient FR-900 tape drives, thousands of pounds of long forgotten image tapes, lots of loaned help including retired engineers and scientists, some money (from NASA ESMD, ARC, IPP, and NLSI, SkyCorp, and SpaceRef Interactive, and Odyssey Moon) and an old abandoned McDonalds restaurant (it was available – we call it “McMoons”), we’ve been able to bring these images back to life at resolutions greater than ever seen before. In many cases, until Lunar Reconnaissance Orbiter (LRO) takes new images, thee tapes represent the highest resolution images of the Moon ever taken from orbit. 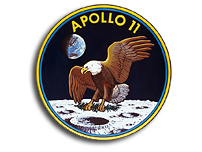 As we ponder the sad news that the original Apollo 11 video has been lost, it is important to note that our Lunar Orbiter tapes might otherwise have been destroyed several years ago had not a stop order been placed on their destruction due to NASA’s search for Apollo 11 tapes and data. One project’s sad news is another’s execution reprieve. Among our successes has been bringing the iconic Earthrise and Copernicus back to life in unprecedented detail. This time we need to report a major disappointment. We recently released two Apollo landing site images – Apollo 12 and Apollo 14 and had embarked upon getting an nice crisp image of the Apollo 11 landing site in time for the anniversary. Alas, unlike the unprecedented resolution we obtained for these two sites, Apollo 11 was a let down. The image is murky and far less clear than previous images. This is not due to the Lunar Orbiter spacecraft or our restored hardware. Rather, we expect, it had to do with someone playing this tape years ago and getting it jammed for an instant. Alas, the interesting part of this tape is framelet 411 which shows the Apollo 11 landing site. So, if there was a natural place on this tape to be paused, rewound, and played again and again and again, it is this location. Little surprise that the chance for damage to this portion of the tape occurred. Our collection of tapes covers the entire five mission Lunar Orbiter project. While we are getting better at deciphering the nomenclature and labeling on the tapes, we still have much to learn. We can now find a specific tape and image in a straight forward process but have still only scratched the surface. And, paradoxically, we seem to have more tapes marked “Lunar Orbiter V” than we need to contain all of the images from that mission. We suspect that we have two (or more) archival collections mixed in or (for some reason) multiple copies of the same images. The only way to know for sure is to look at every tape – one by one. The path to getting this Apollo 11 landing site image was complicated. The image was taken by Lunar Orbiter V on 12 August 1967 at 22:21:13.809 GMT at an altitude of 98. km. Properly retrieved, the resolution of our image should be 2.387 meters per pixel. After our first round of image retrievals, the heads for our FR-900 tape drive needed to be refurbished. This is an expensive and time consuming process with only one or two places in the world capable of doing it. With the heads refurbished we were prepared to run the tape. As we did we found out that our custom made frame grabber had a bad chip which needed to be replaced. Once the gear was good to go, the process of running the tape began. There was an ominous note on the tape can that a section of the tape might be damaged. We soon discovered that indeed there was some damage to a 4 minute segment and it was the portion we were most interested in. Undaunted, Ken Zin, our experienced video tape drive engineer, Al Sturm our electronics guru, and Austin Epps, our vigilant student intern worked long hours to get everything working to see what sort of image we could get. Austin ran the tape multiple times os as to get multiple images we could use to produce a super resolution image of the landing site. Despite this attempt to coax a little clarity out of the noise, the damage to the tape precluded an image of the quality we had hope for – and had achieved for other images. That disappointment aside, we feel that it is important to show our failures and disappointments as well as our crowning achievements. As you will see when you compare it to the best Lunar Orbiter images, the resolution is low. Yet if you compare it with the new LRO images you can clearly see that something appeared in the image and that the regolith was disturbed around that object (humans). We will be combing through the Lunar Orbiter tapes this weekend with the hope that there is another (hopefully undamaged) version of this image. We feel that it is equally important to reveal our failures and disappointments as it is to crow about our successes. We expect to have many of both. Such is the curse of Apollo 11 – for an event so epic in its nature, the frail means where by we captured it and the planning that led up to it – are fleeting. One more reason why all of this fragile history needs to be maintained with constant vigilance – else we lose all of this to the dust of time. 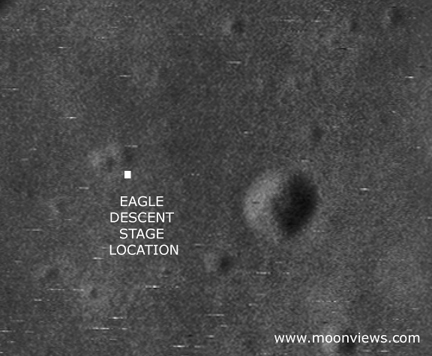 Figure 1 Our retrieved image with the location of Apollo 11’s Eagle Descent Stage. Figure 3 Comparing our retrieved image, one scanned by the USGS, and LRO’s recent image. “Taking the something old, something new approach is the Lunar Orbiter Image Recovery Project, located at the Ames Research Center in the heart of California’s Silicon Valley. This team effort is led by Dennis Wingo of SkyCorp, Inc. in Huntsville, Alabama and Keith Cowing of SpaceRef Interactive, Inc. of Reston, Virginia. The recovery project involves culling through some 1,700 images taken by NASA Lunar Orbiter missions from the 1960’s, convert that data into digital form and then reconstruct the images to yield 21st century pictures far superior than the originals. Ideally, upgrading an old Lunar Orbiter image taken of the Apollo 11 landing zone before Armstrong and Aldrin set foot there, contrasted to a new LRO overhead shot, would present a unique before/after look-see of the historic Tranquility Base site, said Greg Schmidt, deputy director of the NASA Ames-based Lunar Science Institute. “NASA’s Lunar Reconnaissance Orbiter has transmitted its first images since reaching the moon on June 23. The spacecraft’s two cameras, collectively known as the Lunar Reconnaissance Orbiter Camera, or LROC, were activated June 30. The cameras are working well and have returned images of a region in the lunar highlands south of Mare Nubium (Sea of Clouds). As the moon rotates beneath LRO, LROC gradually will build up photographic maps of the lunar surface.